How Are Buddhist Monks Like Christian Monks? 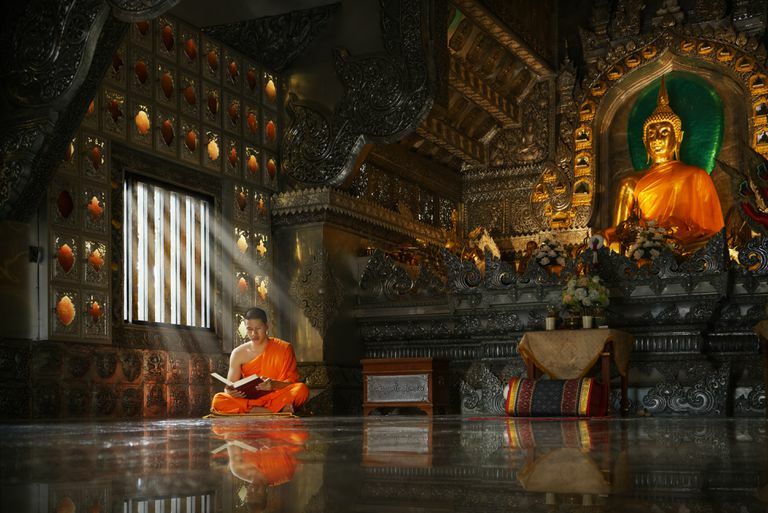 English-speaking Buddhists have borrowed the words monk and nun from Catholicism. And there are a remarkable number of parallels between Catholic and Buddhist monasticism. But there are also some significant differences that might surprise you. The English word monk comes to us from the Greek monakhos, which means something like "religious hermit." Something I did not know until I was researching this article is that before the Reformation, men in the Catholic mendicant orders were called friars (from the Latin frater, or "brother"), not monks. A Buddhist monk is a bhiksu (Sanskrit) or bhikkhu (Pali), The Pali word seems to pop up more frequently, in my experience, so that's the word I'm using here. It is pronounced (roughly) bi-KOO. Bhikkhu means "mendicant." In Catholicism, monks are not the same as priests (although a monk may be ordained as a priest also). My understanding is that a Catholic monk is not considered to be part of the clergy, although he is not a layman, either. Monks take vows of poverty, chastity, and obedience, but (as I understand it) they do not perform sacraments or preach sermons. A fully ordained Buddhist bhikkhu and a Buddhist "priest" are the same things, in that there is no order of clergy separate from the bhikkhus to preside over rituals and give teachings on the dharma. That's what the bhikkhus do when they are ready. My understanding is that ultimately all Catholic monastic orders accept the authority of the Pope. There is no equivalent ecclesiastical authority overseeing all bhikkhus. The functions and lifestyles of bhikkhus differ considerably from one school of Buddhism to another. In the India of 25 centuries ago, wandering "holy men" were a common sight, as they had been for centuries before that. Men seeking enlightenment would give up possessions, wear ragged robes, and renounce worldly pleasure. These ascetics would go from place to place begging for food. Sometimes they would seek out gurus for instruction. The historical Buddha began his spiritual quest as a wandering ascetic. The first Buddhist bhikkhus ordained by the historical Buddha followed this same pattern. They did not live in monasteries at first but traveled from place to place, begging for their food and sleeping under the trees, Although the Buddha had lay students also, from the beginning Buddhism was primarily monastic. The bhikkhus lived, meditated, and studied together, as a moving community. The one time the early monks stopped wandering was during the monsoon season. As long as the rains were falling they stayed indoors, in one place, and lived in communities. According to Buddhist tradition, the first monastery was a complex built during the Buddha's lifetime by a lay disciple named Anathapindika, for use during the seasonal rains. Christian monasticism developed some time after the life of Jesus. Saint Anthony the Great (ca. 251–356) is credited with being the first patriarch of all monks. The first Christian monastic communities were primarily of men who lived mostly as hermits but in proximity to each other, and who would gather for worship services. Buddhism spread through Asia without the direction of any one central authority. Most of the time a fully ordained bhikkhu who had completed his training did not need the permission of someone above him on the hierarchy ladder to establish his own temple or monastery, and when he did so he usually had considerable autonomy to run the place as he wished. There was no equivalent of a Vatican to send out monastery inspectors to demand compliance with the official standards. By the same token, there is a long tradition in Asia of bhikkhus leaving one monastery to practice in another, and the bhukkhu generally did not need anyone's permission to walk out of Monastery X and travel to Monastery Y. However, Monastery Y was under no obligation to accept him. I say "usually" because there are always exceptions. Some orders have always been more organized and hierarchical than others. Emperors of this or that country have sometimes imposed their own rules and restrictions on monasteries, which abbots could not ignore without risk of punishment. In many ways, the lives of Christian monks and Buddhist bhikkhus are quite similar. In both cases, these are communities of people who have chosen to leave the cacophony of the world and devote themselves to contemplation and study. Traditionally the monk and the bhikkhu both live very simply, with few personal possessions. They keep silence at times and live by the monastery's schedule. I believe the bhikkhu has a more central role in Buddhism than a monk has in Christianity. The monastic sangha has always been the main container for the dharma and the means by which it is passed from one generation to the next.